Some people call it dressing while others call it stuffing. I usually call it dressing but stuffing is probably most appropriate being the verb – stuffing it into a bird or one’s self and a noun, the stuffing itself. So, let’s go with stuffing as its is the better description of what is happening. Stuffing is one of those things that a is very personal to one’s childhood. I have very vivid memories of what stuffing should tastes like from how my Aunt Mabra made it. Sorry mom. And, that is what I crave every year. But, there are an infinite number of stuffing combinations. I went to my sorority sister, Letita’s house for Thanksgiving a few years ago and she had put an elegant spin on what is really traditionally humble dish. She used fresh tarragon and exotic mushrooms to create a stuffing that I fantasized about for weeks after. It was earthy, moist, full of flavor and quite delicious. Some people only eat oyster dressing, which does not appeal to me at all. Some, like my maternal grandmother, made a french bread stuffing that was a little boring. 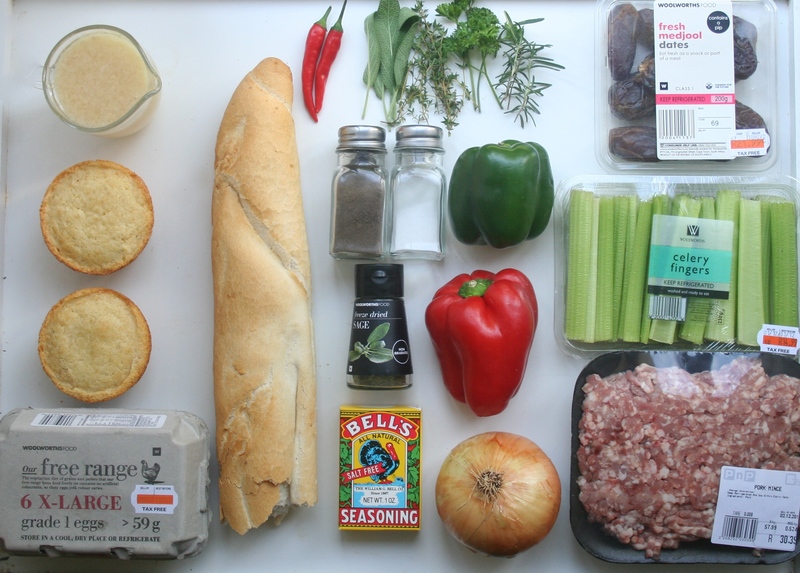 But, for me, come Christmas, I want a moist sweet & spicy cornbread stuffing, bursting with sage sausage loads of celery, peppers and onions. Oh, and a recent addition, chili pepper. So, before you start your stuffing, you will need to choose a bird. I think most people think bird, then stuffing. I think stuffing then a bird. The bird is the afterthought. I am using a chicken because…..just because it’s easier. It’s after Thanksgiving and before Christmas. So, I don’t want to make a turkey. This stuffing recipe makes about 12 servings, which is just enough to serve with two medium South African chickens or one large US chicken, capon, or one small turkey. After washing bird inside and out. Pat dry. Then brush the bird with a mixture of melted butter and poultry seasoning. Roast bird at (425ºF) for about 45 minutes. You will take the bird out of the oven (reserving pan drippings) and place it atop the dressing and cook for an additional 45 minutes or until the thigh reaches 90ºC (190ºF ). If you are unable to make your muffins or buy your bread a day in advance, just crumple muffins into 2 ½ cm (1 inch) chucks and break bread into about the same size pieces. Arrange on a baking sheet and bake at 50 ºC (122 ºF ) for an hour. Brown pork mince (ground pork) and set aside. In the same pan add a tablespoon of butter. 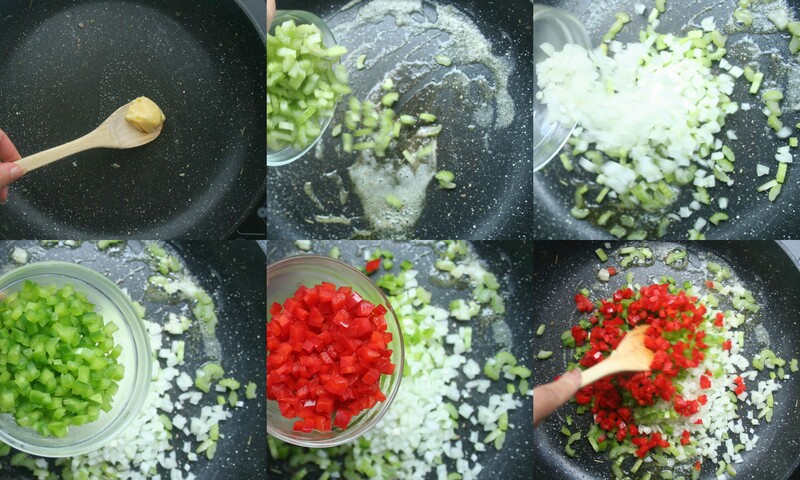 Then add celery, onion, green pepper and red pepper and sauté on medium heat until wilted. Set aside. 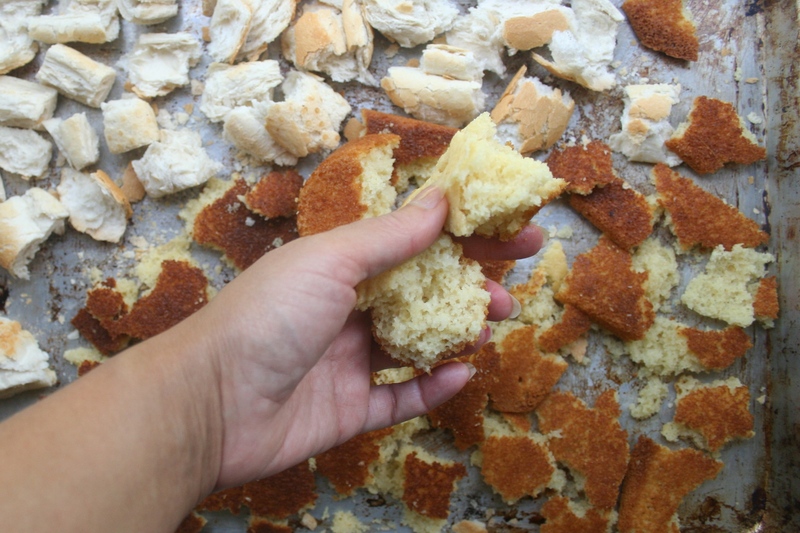 To an extra large bowl or large pot, add the crumpled cornbread and broken French bread. Add vegetable mixture and mince to the bread mixture. 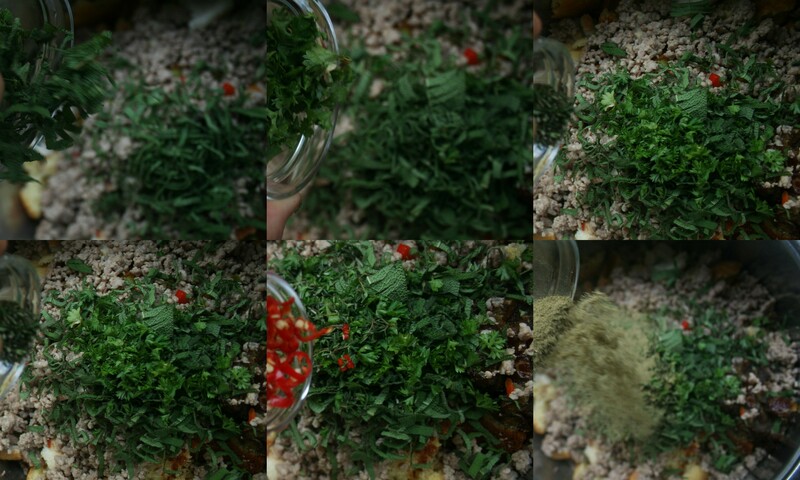 Add sage, parsley, thyme, rosemary, chili (if using), poultry seasoning and dried sage. Add the eggs to stock and beat well. Pour over stuffing. At this point, I like to do a little taste test. Microwave a small sample of the stuffing for about 30 seconds and taste it for seasoning. Adjust salt and pepper or add more of the spices if you think it needs it. Roast bird at (425ºF) for about 45 minutes. You will take the bird out of the oven (reserving pan drippings) and place it atop the dressing and cook for an additional 45 minutes or until the thigh reaches 90ºC (190ºF ).